Edward Copeland's Tangents: Close Friends Get to Call Him T.C. In 1957, when Metro-Goldwyn-Mayer closed its animation department and informed loyal employees William Hanna and Joseph Barbera (the creative team behind MGM’s Oscar-winning cat-and-mouse duo, Tom & Jerry) of their decision with a single phone call, Bill and Joe found themselves at a literal crossroads. They could go back to honest work (Barbera, for example, had been in banking before landing a job in show biz) or they could soldier on in the burgeoning field of television animation — which, because of the medium’s restricted budgets, used fewer drawings than its theatrical brethren (even though this stylized method of cartooning had actually been put in practice earlier by U.P.A.). Hanna and Barbera decided that they loved creating, directing and producing cartoons too much to give it up, so ignoring naysayers who decried the “abomination” of limited animation, launched a successful cartoon conglomerate devoted to entertaining TV audiences…that, to its credit, also engaged many of their former and now unemployed colleagues when the other motion picture studios ceased their animation operations as well. With Hanna-Barbera’s first success in The Ruff & Reddy Show in 1957, the two men began to create characters recognized as animation icons today: Huckleberry Hound, Yogi Bear, Quick Draw McGraw…I could name them all day long. Their most audacious endeavor came in the fall of 1960, when television’s first prime time animated situation comedy, The Flintstones, premiered on ABC and became a monster hit. Of course, in show business you’re only as good as your last success — so to prove that the modern Stone Age family’s series was no flash in the pan, the company premiered its second prime time cartoon project 50 years ago on this date on a Wednesday evening following The Steve Allen Show: the indisputable leader of the gang, Top Cat. In discussing the history of their famous animated employees, Bill Hanna and Joe Barbera eventually became known for…well, hiding a few facts about the inspiration behind their creations — and Top Cat is no exception. Barbera once recalled in an interview that a single drawing of the titular character that was taking up space on his office desk provided the spark of genius. While I’m certainly not going to dispute Joe’s version of Top Cat's genesis, I think he’s holding back a little. Their previous foray into prime time, The Flintstones, was pretty much an animated version of The Honeymooners (and the only reason why Bill and Joe didn’t get a subpoena from Jackie Gleason challenging them on this is because Gleason didn’t want to become known as “the man who killed Fred Flintstone”). 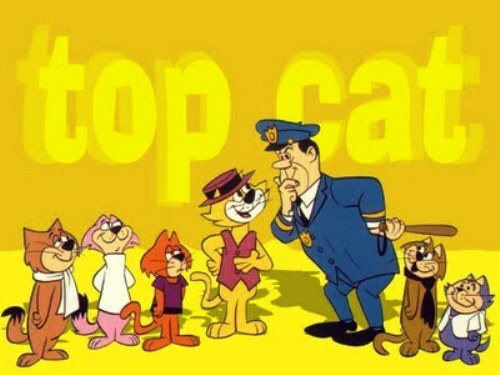 Top Cat followed the formula established by Flintstones by taking the main character and premise of The Phil Silvers Show (aka You’ll Never Get Rich and Sgt. Bilko) and transferring them to a fictional area of Manhattan (known as “Hoagy’s Alley”), staffed with a roster of supporting characters who might have answered a casting call for one of the Bowery Boys films had Monogram-Allied Artists still been cranking them out in 1961. T.C., as his chums called him (provided it was with dignity), was the major domo of a group of misfit feline denizens residing in the less tonier section of the Big Apple, and was constantly concocting various ways to earn a fast buck. I wouldn’t be surprised to learn that a needlepoint framing of “Imitation is the sincerest form of flattery” hung in a prominent place in the offices of Hanna-Barbera, because so many of their creations featured voices (usually supplied by veteran voice artist Daws Butler) based on famous celebrities: Yogi Bear imitated Art Carney, Snagglepuss channeled Bert Lahr, Wally Gator was Ed Wynn incarnate. In fact, Bill and Joe had previously gone to the Phil Silvers Show well when they added conniving Hokey Wolf to The Huckleberry Hound Show cast (Hokey replaced the departing Yogi Bear, who left for the studio’s first spin-off series). Hanna-Barbera could just as easily prevailed upon Butler to recycle Hokey for Top Cat but instead they went with second banana and character actor Arnold Stang, who was no stranger to voice work (Stang had started out on radio, and was known for “sidekicking” the likes of Henry Morgan and Milton Berle) and whose Phil Silvers-like intonations were right on the money. To add a little authenticity to their Bilko rip-off…er, I mean homage, they also hired Maurice Gosfield to voice Top Cat’s “conscience,” Benny the Ball — Gosfield had been a cast member on Bilko, playing the part of Private Duane Doberman (both Doberman and Benny shared the same rotundity and good-natured, wide-eyed naiveté). The choices of Stang and Gosfield to provide the voices for the program’s main characters were inspired ones and set Top Cat apart from the usual Hanna-Barbera fare in that more often than not, the studio would usually fall back on the services (talented though they were) on artists like Butler, Don Messick, Paul Frees, Hal Smith, Jean Vander Pyl, etc. These actors did contribute to the series in various guest star capacities, but Top Cat made offbeat and interesting casting decisions for its supporting cast such as tabbing veteran Warner Bros. character thesp Allen Jenkins to voice T.C.’s nemesis, cop-on-the-beat Charlie Dibble (Top Cat liked to avail himself of “Dribble’s” call-in box as his own personal telephone) and Marvin Kaplan (a film, TV and radio veteran best known as “Alfred Printzmetal” on the sitcom Meet Millie and later as the constantly complaining phone repairman Henry Beesmeyer on Alice) as Choo-Choo, the tall pink feline clad in a turtleneck sweater. Actor Leo DeLyon did double duty on the show, providing the speaking tones of the beatnik cat Spook and the stupefyingly dense Brain (whose nickname was most assuredly a misnomer). Stang, Gosfield, Jenkins, Kaplan and DeLyon no doubt landed their respective gigs because the feline characters needed Noo Yawk accents; only John Stephenson, who voiced the feline lothario known as Fancy Fancy (who sounded a great deal like Cary Grant), was a H-B veteran (best known for voicing Fred Flintstone’s boss, Mr. Slate). Sponsored by Kellogg’s and Bristol-Myers, Top Cat — despite tepid competition from CBS (Checkmate) and NBC (The Joey Bishop Show) — failed to duplicate the longevity of the more popular Flintstones, and so its 30 episodes were exiled to Saturday mornings to be rerun from 1962 to 1969. (Interestingly, Top Cat lasted longer in comic books than on the tube, his adventures being published by Dell, Gold Key and Charlton until 1973.) But despite getting a pink slip from the American Broadcasting Company, Top Cat and his associates would manage to find work in later Hanna-Barbera productions; they were featured among the cast of the 1972 cartoon special Yogi’s Ark Lark (but didn’t make the cut for the subsequent series, Yogi’s Gang) and T.C. himself was in charge (still the leader of the gang!) of handing out the titular assignments on the 1985 series Yogi’s Treasure Hunt. Two years later, the Hanna-Barbera folks produced a feature-length TV movie entitled Top Cat and the Beverly Hills Cats, and in the 1990s characters from the show would turn up in featured bits on Wake, Rattle and Roll and Yo Yogi! and cameos in such series as Harvey Birdman, Attorney at Law and The Powerpuff Girls. Despite its limited success in the United States, the show later was sold to countries all over the world — in the United Kingdom, however, the series has to be rechristened “Boss Cat” so that the BBC wouldn’t inadvertently endorse a brand of cat food with the same name as the U.S. program. Top Cat was a major phenomenon in Mexico, Peru and Argentina…where Don Gato y su pandilla (translated: Mr. Cat and His Gang) enjoy celebrity fame equal to that of the Flintstones and who was just recently the subject of an animated feature film — released in 3-D, even, as another famous H-B feline might say. Top Cat might very well be the least-remembered of Hanna-Barbera’s prime time animated series — it didn’t last as long as The Flintstones, and though its one season stint was later duplicated by The Jetsons and The Adventures of Jonny Quest, both of those series were later revisited with new episodes (between 1985 and 1987…with a revival series, The Real Adventures of Jonny Quest produced in the 1990s). It’s currently enjoying retirement on the cable channel Boomerang, however, and the program’s entire run was released to DVD in 2004. Personally, it’s my favorite of Bill and Joe’s “kadult” creations: the characterizations are timeless, the dialogue often hilarious and its theme song is one of those ditties that’s almost impossible to get out of your head once it’s in there (hey…Bob Dylan uses it on his radio show…you can’t get much cooler than that). As far as I’m concerned, he’s the boss, he’s the pip, he’s the championship. He’s the most tip top…Top Cat.